Overnight at a lovely campground is just a quick ferry and 8-mile bike ride away at Manchester State Park. The bodies of water and mountains that surround the Seattle-area are an incredible asset to the cyclists living and riding here. Even a mundane ride feels special when you grab a glimpse of Mount Rainier, snow-capped Olympic peaks, or the Puget Sound’s beautiful expanse on a sunny day. 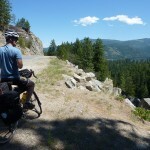 Those immovable geographic boundaries are also a boon for bike campers. A quick ferry ride across the Sound or a short ride towards the Cascades leads to a half dozen or more places to camp, some as little as 8 miles from downtown Seattle! Manchester State Park falls into that category of easy to access, but still lovely campgrounds near Seattle. 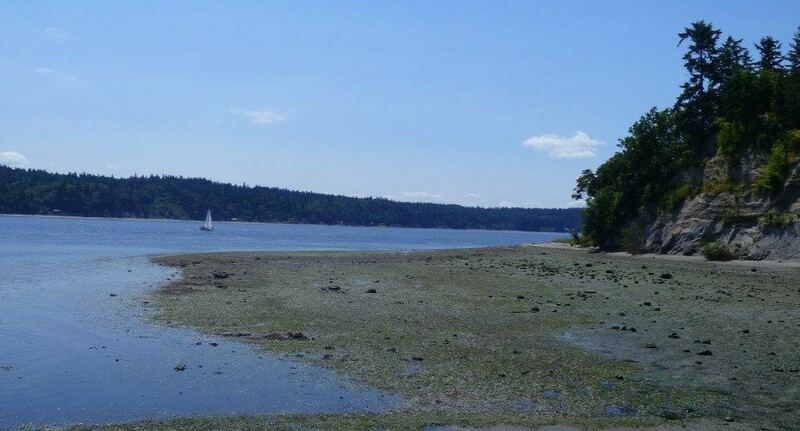 It sits right on the water in theKitsap Peninsula and has beach access and hiking trails through the woods, has 3 first come first served hiker-biker campsites, 35 reservable sites, and bathrooms with potable water. 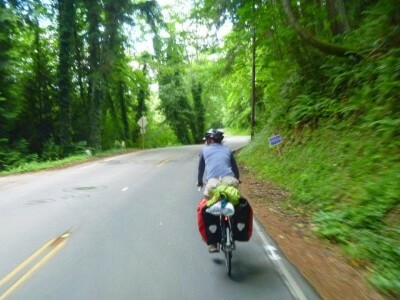 As such, it makes for an excellent intro to bike camping for novices or easy escape for seasoned pros. You could even head out after work on a weeknight and make it back to your desk at the regular time the next morning. There is a small convenience store on the right as you get off the Southworth ferry. It has snacks and drinks and beer, but not much in the way of real food. There are no grocery stores on route, so you’re better off stocking up on groceries before you head out. If you do need real groceries, you can detour a few miles on the appropriately named Mile Hill Rd into Port Orchard where there is an Albertsons and a QFC. The ride starts after taking the Washington State Ferry from Fauntleroy in West Seattle to Southworth. After getting off the ferry head straight on SE Southworth Ferry Dr. At mile 3.1 take a right onto Yukon Harbor Rd and enjoy a little beachside riding on a quiet neighborhood road. At mile 4 take another right onto Colchester Dr SE. At mile 5.4 take a left onto Main St then your immediate next right on to Beach Dr. Stay on Beach for about 2 miles, then take a right on E Hilldale Rd into Manchester State Park. 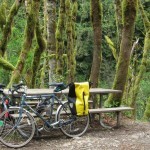 That’s right, it’s 7.5 miles of riding from West Seattle to forested camping in a state park. 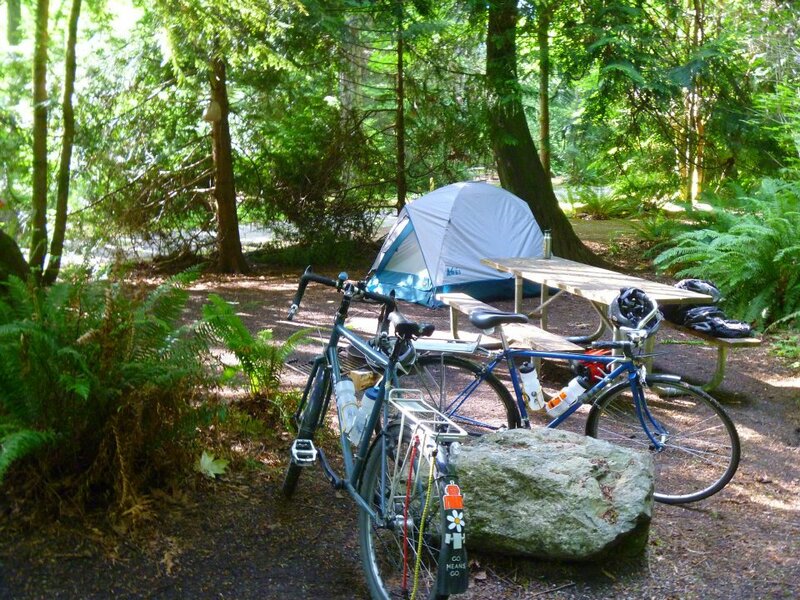 Even if you’re riding from your home and office in Seattle it’ll be a sub-20 mile ride to lovely, forested camping. When you’ve had your fill of campfire stories, s’mores, and sleeping under the stars, simply retrace your steps to the Southworth Ferry. If you want to make a loop of it, or are really pressed for time, take a right on Beach Drive as you leave the park instead of a left. Stay on it as it hugs the shoreline and turns into Bay St. This will take you into Port Orchard where you can catch the Port Orchard-Bremerton Foot Ferry (bikes are allowed). Note the foot ferry does not run on Sundays. From there you can hop on the Bremerton-Seattle ferry that will drop you off right in Downtown Seattle. 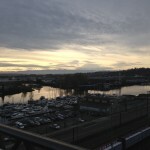 This article was posted in Adventure, Ferries, Kitsap County, News, Tourism, Travel. Bookmark the permalink. Follow comments with the RSS feed for this post. Both comments and trackbacks are closed. 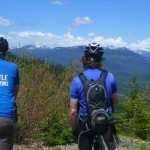 PS I LOVE this series of article you are doing about various rides! Excellent article! We first did this ride after Peter Lagerwey mentioned it in the newspaper as his favorite ride in the 80’s. We found it made a great after work ride for a Friday in summer too.